Heavy Fuel Oil is a low-grade fuel primarily used in industrial boilers and other direct source heating applications (refer to Figure 1). It is also used as a principal fuel in marine applications and large diesel engines. HFO is typically blending the residue left over from the crude oil refining process with diesel or gas oil. Those residues, which at ambient temperatures are solid, are sometimes called asphalt, tar, residual oil or “tower bottoms”. Blending with diesel or gas oil (“cutters”) produce a fluid which, at ambient temperatures, is suggestive of molasses. Given its high boiling point and tar-like consistency, HFO typically requires heating before it can be moved through pipes or dispensed into a boiler or other heating vessel to be burned. Similarly, HFO must generally be stored in a heated state. 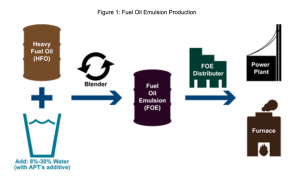 HFO is one of the least expensive of the refined oil fuels and generally can only be used by facilities that have preheating capabilities. HFO combustion temperatures are typically very high and produce noxious emissions, particularly NOx and PM. In addition, HFO does not burn cleanly, leaving significant quantities of carbon residue, which foul combustion chambers and reduce furnace and boiler efficiencies. Periodic removal of that fouling is expensive and time consuming. APT’s Heavy Fuel Oil Emulsions are direct substitutes for HFO, which is sometimes called #6 fuel oil, bunker or residual oil. The water content of APT’s Heavy Fuel Oils can vary between 8% to 30% depending on the application and the customer’s need. Fuel Oil Emulsions are products designed for boiler applications and large, slow speed internal combustion engines. FOE can be used in utility, industrial and commercial boilers, and marine engines. Water content can range between 8% and 30% and additive content can range between 0.05% and 2.0%. FOE fuel can be tailored to enhance various boiler operating conditions. Fuel tailoring is mainly achieved through varying the water content. While FOE can contain a range of water content, generally FOE can be categorized into 2 fuel types; Low Water Content and High Water Content. Low water content FOE is an emulsion of HFO with water content ranging from 8% to 12%. It is an oil phase-emulsion, i.e. microscopic droplets of water are suspended in the HFO base. The secondary atomization of the HFO base resulting from the water content flashing into steam produces a far greater surface area, which improves combustion. High water content FOE is an emulsion of HFO with relatively high water content (15% to 30%). Unlike FOE, it is an oil-in-water emulsion. The water improves combustion by creating secondary atomization of its oil content similar to FOE. However, its higher water content significantly reduces peak combustion temperatures, which result in dramatic reductions in NOx. Although High water content FOE is more expensive than HFO (water does not have any BTU value), it is a product that, in addition to the benefits offered by FOE, significantly reduces NOx emissions for primarily large boilers. As such, in the medium term, the United States and Europe will be particularly attractive to operators of dual fired power generation assets, i.e. power plants that are permitted to burn natural gas or oil. FOE is a product that meets a current market need in the industrial and commercial market segments, and has the potential to grow as emissions reductions become mandatory on industrial and commercial boilers. FOE’s primary benefits are operational improvements and reduced maintenance costs, with secondary environmental benefits. Most ash and slag buildup problems in boilers are a result of incomplete combustion of carbon. Unburned carbon is sticky and binds the ash onto boiler surfaces. If the unburned carbon and ash combination “cooks”, it forms a liquid-type material. When this material comes in contact with a cooler surface, such as a boiler tube, the liquid material hardens forming a slag on the tube surface. This slag hinders heat transfer and results in reduced efficiencies. 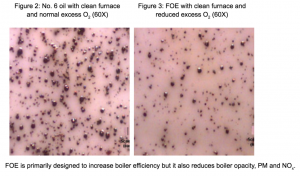 Due to “cleaner” combustion characteristics, FOE is capable of reducing these inefficiencies, with the degree of improvement depending on the boiler’s configuration. Testing has demonstrated that boilers relying on convection heat transfer, rather than radiant heat transfer, will benefit more from the use of FOE. Secondary benefits of lower water content FOE are related to the environment. More complete carbon burn-up reduces the opacity (smoke) and particulate matter emanating from the stack. In addition, the secondary atomization allows boilers to operate with less excess O2, which consequently reduces NOx emissions. NOx is created when nitrogen (N2) is combined with oxygen in the presence of heat. Reduced oxygen requirements translate directly into lower NOx emissions. Stack opacity (smoke) and particulate discharge is a major concern to boiler operators. FOE reduces the amount of particulate emissions and, by improving combustion efficiency, reduces opacity. Figure 2 and Figure 3 below illustrate particulate emissions from an impact plate test. Note that for FOE, the particulate density is less and the size of the particulate matter is smaller, indicating that FOE is achieving secondary atomization and higher carbon burn-up.